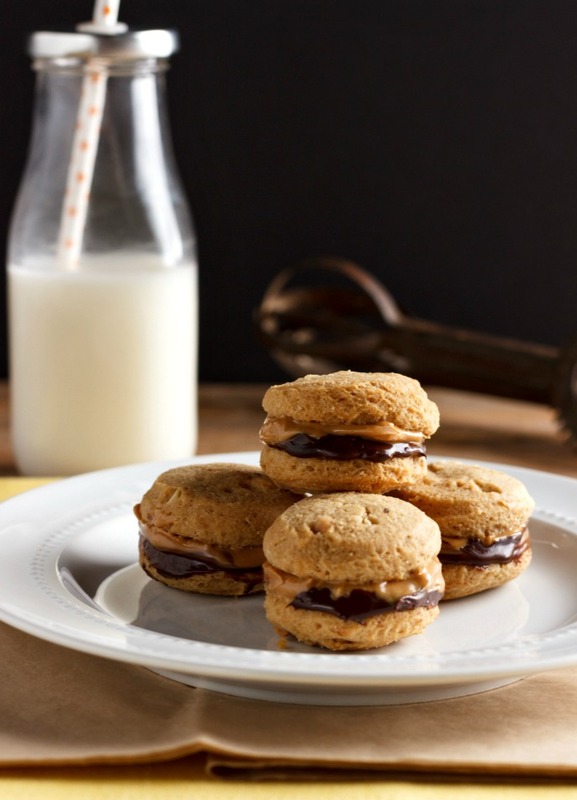 Chocolate Nut Butter Sandwich Cookies Low Carb are grain free with paleo and nut free options. These Chocolate Nut Butter Sandwich cookies will remind you of “Nutter Butter” cookies, only healthier and yummier with the addition of chocolate filling. 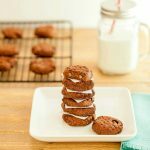 A grain free, gluten free, paleo and low carb sandwich cookie filled with nut butter and melted chocolate. 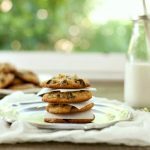 My kids and I were all over these tasty cookies! They even have a nut free version, if you use sunflower seed butter to replace the nut butter. First: I baked the simple nut butter cookies & cooled them completely. Then I turned them over (flat side up). Second: I melted some chocolate chips, cooled them and spread on half the cookies. Third: I spread refrigerated nut butter or sun flower seed butter on the other half of the cookies. Last: I sandwiched the halves together. 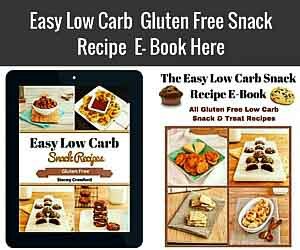 ¼ cup chocolate chips: sugar free chips for low carb (I used Lillys), or use Enjoy Life Chips for paleo version. Using a stand mixer, or electric hand mixer & large mixing bowl combine: butter, nut butter of choice and sweetener of choice. Mix until creamy. Add egg and coconut flour. Mix until smooth, scraping the sides with a rubber scraper. Spoon rounded small ½ tbsp onto the cookies sheet. I rolled mine into balls and then pressed down a lightly to flatten a bit with the back of a spoon. Bake for 15 to 20 minutes, or until browned. Remove from oven and cool completely, as they will be too soft to remove until cooled. While cookies are cooling, place the ¼ cup nut butter in the fridge. Melt the chocolate chips over a double boiler or in the microwave on melt setting. Once chocolate is melted, let cool a few minutes until cooled off a bit, but not starting to solidify. Once cookies are completely cool, turn all of the cookies upside down (flat side up). Spread a teaspoon melted chocolate on half of the batch of cookies. Spread a teaspoon of of refrigerated nut butter on the other half batch of cookies. Sandwich the chocolate and nut butter halves together. Enjoy! Can be stored at room temp for a day, but then should be stored in the fridge. Nutritional Data for Low Carb Version (using Swerve sweetener and Lilly’s baking chips): Yield: 12 sandwich cookies, Serving Size: 1 sandwich cookie, Cal: 200, Carbs: 6.5 g, Net Carbs: 3.5 g, Fiber: 3 g, Fat: 17 g, Saturated Fat: 8 g, Trans Fat: 0 g, Protein: 6 g, Sugars: 1 g.
Chocolate Nut Butter Sandwich cookies will remind you of “Nutter Butter” cookies, only healthier and with the addition of chocolate filling. 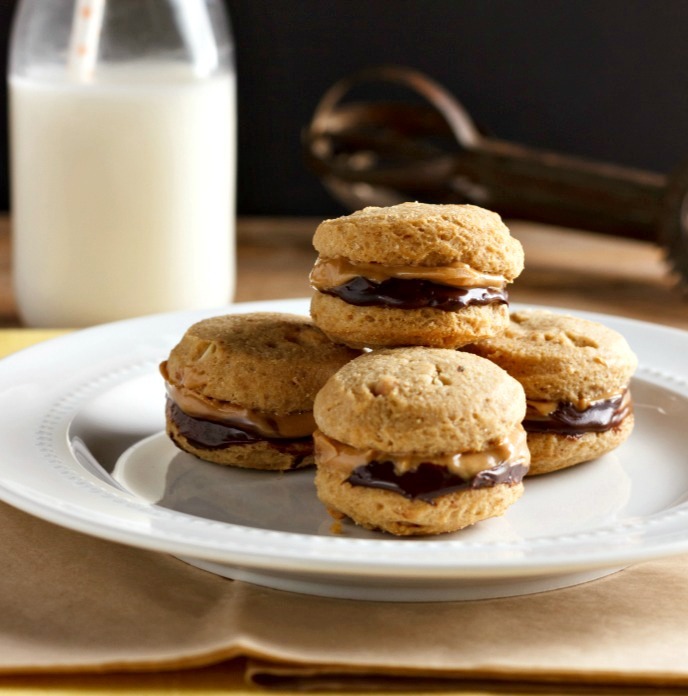 A grain free, gluten free, paleo and low carb sandwich cookie filled with nut butter and melted chocolate. 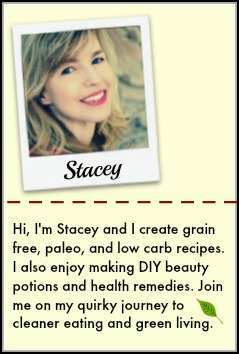 Course: and gluten free, and grain free, and low carb, and paleo version. ¼ cup chocolate chips: sugar free chips for low carb , or use Enjoy Life Chips for paleo version. Preheat oven to 350 F, and line or grease 2 baking sheets. Spoon rounded small ½ tbsp onto the cookies sheets. I rolled mine into balls and then pressed down a lightly to flatten a bit with the back of a spoon. 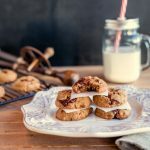 I love that your nut butter cookie recipe is so simple! I would probably eat 5 of these in a row, lol. Oh my…. I think you’ve found the way to my heart with these haha! How good do they look?! Oooh, I love a good sandwich cookie. These sound fabulous! Is there anything better than the awesome combo of chocolate and nut butter? Oh I know! When you add that combo as a filling for cookies! These look delish! I wish I had some of these to enjoy tonight! I love that they’re low carb, but that flavor combo is what’s calling me. So yummy! I’m drooling!!! These look so good! These cookies look so delicious! I love the chocolate filling! 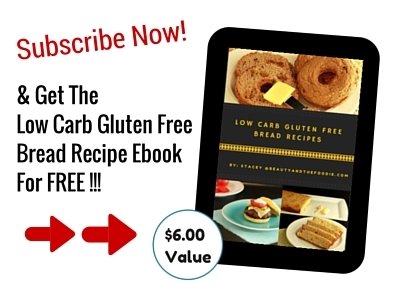 Wow I love this low carb biscuit, not too many ingredients to find and I adore nut butter, I cant wait to make them! Wow ! These are so cute and so delicious ! I want to dip them into my morning hot coffee ! So YUM !!! These are sooooo dreamy!!!! I must try them! Yum! 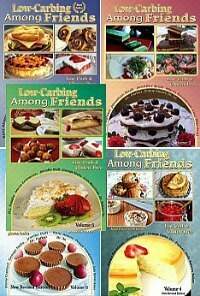 These are the best low carb desserts I have ever seen. YUM!! Wow, these look so good! 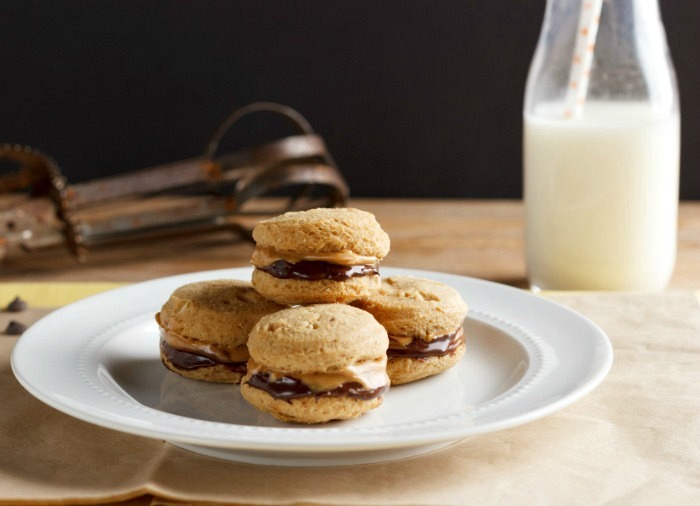 I love the combo of nutbutter and chocolate anyway, but in a cookie -divine! These look incredible, and that oozy chocolate filling just won my heart! Thank you so much Kari! Melted chocolate wins me over too! No way! And as I was reading down to the recipe I was thinking this was going to be super complicated, but the recipe is so simple – such great simple ingredients! Oh mah gah how the heck are these low carb!! They look so good!! Thank you Allison. They are low in carbs but are high in fat (the good kind).